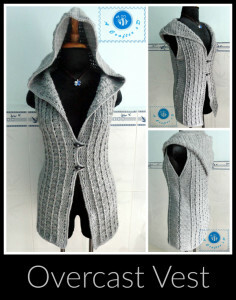 Keep your upper body nice and cozy in this stylish hooded vest. It’s sleeveless, making it great for over a t-shirt or any long-sleeved shirt. This pattern is available in a large size. Other sizes can be purchased in a PDF file. To crochet this you will need a worsted weight yarn, an H crochet hook and buttons. If you enjoyed this free crochet pattern you might also enjoy more designs by Maz Kwok’s Designs.